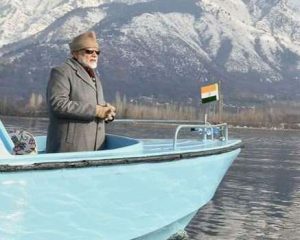 New Delhi: The Indian Meteorological Department (IMD) has confirmed that Prime Minister Narendra Modi created a wave on Dal Lake in Srinagar by waving his hands at the empty lake. Thankfully, the weather office said, it hasn’t impacted the weather system drastically. “Yes, we did detect a weather system, a kind of air wave, emanating from Dal, when the PM was there. We have named it the Modi wave,” K J Ramesh, Director General of Meteorology, IMD said. Ramesh said the wave had the potential of disrupting the local weather system, and in collusion with Western disturbance could have lead to a storm. “Thankfully, the wave fizzled out, and did not create a storm. Looks like PM Modi was only trying to make a statement,” the official said. A statement issued by IMD and widely circulated by Modi’s Bhartiya Janta Party (BJP) on its twitter handle said that the otherwise calm water of Dal lake was rocked heavily when the PM was creating the wave. “I pity the Congress party and detractors who said water was rocked because of the movement of meek motorboat PM was riding. They seem to have forget the heroics of Bal Narendra, the childhood stories of Mr Modi,” Jitendra Singh, Minister of State for Prime Minister’s Office told Dapaan. The next episode of Mann Ki Baat would be dedicated to this very subject to clear air around the wave, Singh said. Meanwhile IMD has declined to link the “Modi wave” to an earthquake that rocked Kashmir the next day. “No, no, no, that quake with epicentre near Muzaffarabad is a proof of the disturbance Pakistan creates in Kashmir. We cannot attribute it to the prime minister… unless we have such directions,” Ramesh said.